Health and Biomedical Informatics is a rapidly evolving multidisciplinary field; one in which new developments may prove crucial in meeting the challenge of providing cost-effective, patient-centered healthcare worldwide. 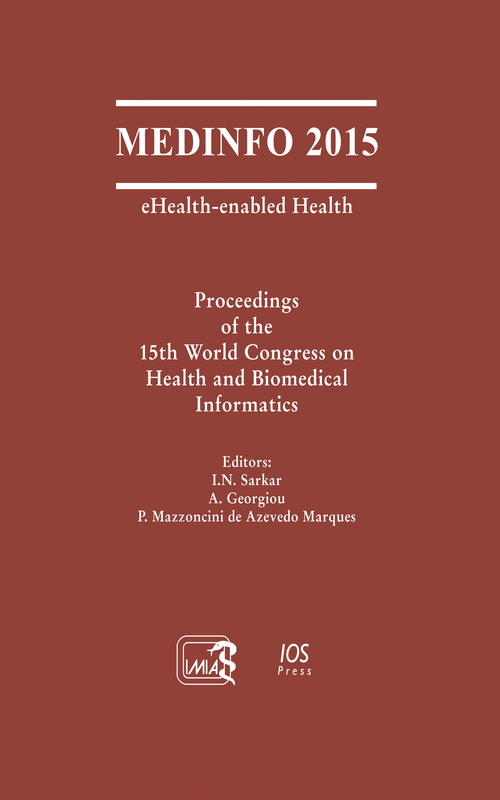 This book presents the proceedings of MEDINFO 2015, held in São Paulo, Brazil, in August 2015. The theme of this conference is ‘eHealth-enabled Health’, and the broad spectrum of topics covered ranges from emerging methodologies to successful implementations of innovative applications, integration and evaluation of eHealth systems and solutions. Included here are 178 full papers and 248 poster abstracts, selected after a rigorous review process from nearly 800 submissions by 2,500 authors from 59 countries. The conference brings together researchers, clinicians, technologists and managers from all over the world to share their experiences on the use of information methods, systems and technologies to promote patient-centered care, improving patient safety, enhancing care outcomes, facilitating translational research and enabling precision medicine, as well as advancing education and skills in Health and Biomedical Informatics. This comprehensive overview of Health and Biomedical Informatics will be of interest to all those involved in designing, commissioning and providing healthcare, wherever they may be.